Displays important training data: performance (Watt), calories, heart rate, etc. The Concept2 SkiErg (PM5), wall model offers the possibility to do an effective whole body training and to improve your technique for the winter season. All muscle groups can be demanded - all at once or especially. Arms, legs, abds, and back are strengthened; fat burning is activated thanks to the wide-range demand. Transmission of training data to PC, Tablet or Smartphone via Bluetoot Smart or ANT+ etc. Exercise in sitting and standing position with the Concept2 SkiErg. The SkiErg (PM5) is excellent for persons with physical constraints. Thanks to the practical wall mounting, the SkiErg of Concept2 needs only small space and can be set-up in almost every room. 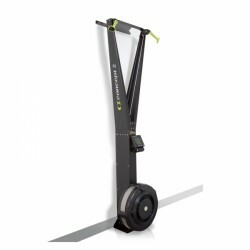 In combination with the optionally available SkiErg frame, it can be placed everywhere and can be moved - if required - thanks to its transport wheels. Concept2 SkiErg frame In stock!